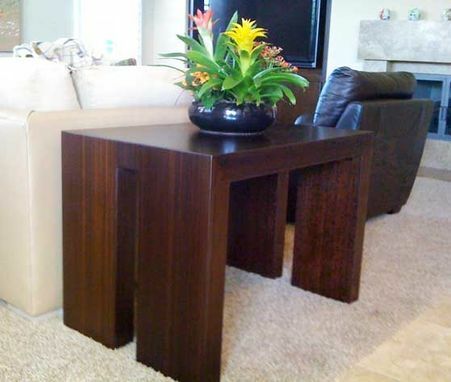 Simple, clean lines of this contemporary table harmonize with the deep chocolate color of the carbonized bamboo. Our bamboo material is harvested using highly sustainable procedures and manufactured with non-formaldehyde adhesives. We offer a wide variety of bamboo materials with unique colors and grain patterns. Also, other sustainable materials are available. Dimensions: As shown, 24"W x 36"L x 26"H. Custom dimensions and other materials available.